Recently, CMS SPARC Prime NewWave announced the launch of a new Collaboration Center. 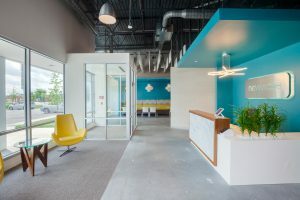 FedHealthIT had a chance to connect with the company’s CEO, Patrick Munis, about the Center’s design, intent, and the opportunity. 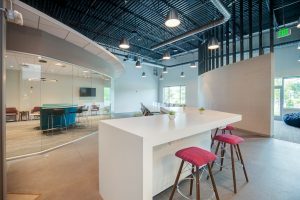 The Collaboration Center began with a desire to build an environment for the sole purpose of sparking creativity and innovation through collaboration between Team NewWave, partners and customers. 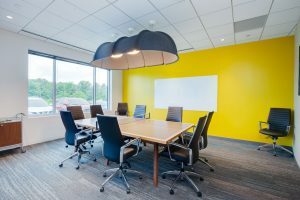 Wanting the center to be in close proximity to its main customer, CMS, to host creative sessions, and to easily facilitate meetings for partners to collaborate on ideas, the vision evolved to its current model: a physical place dedicated to innovation. 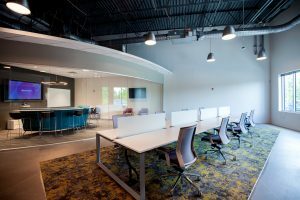 Understanding that innovation is driven by new ideas and the opportunity to grow and evolve those ideas, the Collaboration Center is an open concept design, intending to be a highly collaborative environment. All of the work stations are open and instead of walls, glass separators have been installed so that users are able to connect visually. “We believe the best innovation is born from a diversity of ideas so that means allowing for interaction, for connecting, and for sharing on many levels. NewWave also understood that collaboration doesn’t just take place in the workspace. One of the Center’s key areas therefore is the café, where people can grab a drink or a bit to eat while continuing their discussion, or to engage in something new. Behind the bright colors and bold design of the Center is, of course, technology, including Surface Hubs for meetings and AR stations. NewWave already has two projects slated for work in the Collaboration Center: The Next–Generation Help Desk through its new win BOSC, the $70 million dollar business operations center contract with CMS; and myCareAI – a consumer mobile application through which Team NewWave will work to empower consumers by allowing them greater access to their health information to reduce Healthcare cost and increase health outcomes.